Under Linux it is possible to define a wakeup time for the system (/proc/acpi/alarm). So when it gets shut down it will automatically start again at the desired time. It is possible to achieve the same behavior under Windows. However, some restrictions apply. For example it is only possible for the system to wake up (resume) from suspend mode (Standby). Not if it was shut down completely. This is the reason why in WebTemp the edit box "wakeup time" only gets active after choosing "Suspend mode". The second thing is, you have to tell the system when to wake up right before the command. That means that WebTemp has also to issue the standby command by itself. If you hit a standby button somewhere on your computer, it will not wake up automatically. Enable this in all plans you want to use. It is also possible to issue the command via command line. Just execute WebTemp with parameter -suspend and an optional wakeup time. 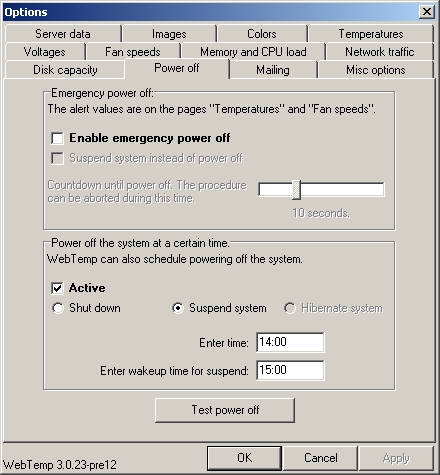 WebTemp will suspend the system immediately. It will resume at 9:00. Please use a time format which is common on your system.